Do you know how to write to Jeff? Or more importantly, what to send him and WHEN to escalate to Jeff’s Executive Seller Relations teams? By the looks of contact forms and account suspension appeals I see on a weekly basis, many sellers guess at how to escalate their appeal. Despite the make or break nature of an escalation for reinstatement, I consistently find sellers taking the same exact Plan of Action that Seller Performance rejected and sending it to [email protected], hoping for a better answer. That approach may work one of out a few hundred times, but even that likely comes from an investigator who didn’t particularly care about the outcome either way. Aside from blind luck, Amazon wants you to follow an actual process. No reply? Bad reply? Amazon looks like they never read it? Write to Jeff! He’ll take care of it! There’s a lot of bad advice and misinformation in Seller Forums and from so-called experts regarding Jeff escalations. No, you can’t skip over Seller Performance right to Executive Seller Relations. You can’t write to Jeff to complain or demand reinstatement. You need to escalate the right way, or you’re wasting your time and wasting your chances at reinstatement. When is the right time to do an Amazon escalation? 1. Don’t email over and over. Don’t spam the queues because you didn’t get a reply as quickly as last time, or you didn’t get a reply you liked. Have they truly ignored your POA? As in, you haven’t heard from them in days. Sure, go ahead and nudge them along. Has it only been a couple of hours and you’re anxious? Give it time. If you’re antsy and need something to do, start composing an email to send them later, nudging a reply out them. Or even prep an escalation. 2. Don’t escalate until it’s time and you’ve truly reached a dead end with Seller Performance. Never assume investigators failed to read the POA. If Seller Performance ask you for more information, give it to them. Look closely at how you can improve your Plan of Action. Only escalate your POA if you’re certain it will have a good chance. Don’t rush your appeal because you’re losing revenue every day, and want to get the entire process over with. Do the opposite. If necessary, get tough on yourself, and play devil’s advocate for a bit. What will Amazon think your plan is lacking? What will they think of your invoices or supply chain documents, are they likely to accept them? 3. Is your POA too long? Does it include every notification you ever had, any unresolved buyer or brand complaint, any bad feedback you received from earlier this year? Don’t tell Amazon your life story, please. Seemingly crucial content often will sound important to include to you while an investigator simply rolls their eyes and skims past it. It may not be fair, but the we shouldn’t deny the reality. Amazon’s investigator has 3 minutes to assess your POA. 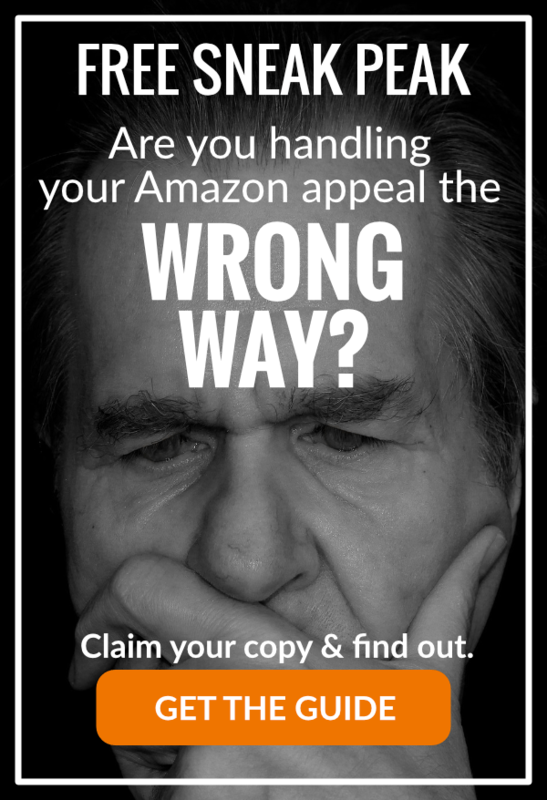 Trying to tug at heartstrings or blasting Amazon for their total lack of fairness only succeeds when in rare cases your desperate plea comes with a solid POA that Amazon clearly ignored. Remember your audience, and give them exactly what they need to reinstate you. Use an easily skimmable format. Working at Amazon is not just about making the right decision on reinstatement or denial, it’s also crucial for them to decide quickly and move on. There are way too many investigations in front of them for lingering on this or that seller account. They have to keep it moving, and so do you. 4. Don’t take each ASIN cited in your suspension notification and pick off what may have attracted negative Amazon attention. Make sure you create a holistic plan, not narrowly focused on particular products you’ll never sell again. How will you fix the issues at the account level? Before you even entertain the notion of writing to Jeff. If you happen to have a direct email to someone at Amazon, you’re probably tempted to email them to to “jump start” or “accelerate” your case., But, will that email truly give you a better chance? Many direct email addresses shared with sellers that I’ve seen only direct you into the inbox of someone who works at the company, somewhere, and not to relevant teams. Know why a lot of them never reply? They have nothing to do with the appeals process, they’re just window dressing pitched to you as a meaningful contact. Don’t believe it unless they have a track record of helping sellers with their suspension cases, and doing it by looking at a POA for the purposes of giving useful advice to you. Make sure you have a really solid POA before you even think about escalating your case to a senior investigator, or a manager. If you bang on doors hoping for a fresh review of your last appeal and your POA comes up empty, you may not get another chance. Consider how much time has truly passed before you agitatedly send another message demanding a response. Did they reply within 24 hours the last time you emailed Seller Performance, so you think something is wrong when it’s 25 hours this time? It doesn’t work like that. Understand how Amazon processes contacts in email queues before you make potentially account-threatening decisions about pushing escalations along. If you’re emailing Jeff, write a real escalation letter and make sure it highlights the key pieces of your POA, because if it doesn’t and they toss it aside, you may never get another chance. Either way, the responsibility to understand who to listen to and when to escalate rests ultimately with each seller who is suspended. If the seller makes the wrong choice at the wrong time, it could create permanent damage. Understand and embrace that concept before you pull the trigger on the correct path towards reinstatement. If in doubt, invest in hiring an expert, that understands how Amazon’s teams work, for your best chance at reinstatement.